Defines tax rules for individual, or groups, of sale items. Your country, state or province may have specific tax rules for different types of items. In order to make sure taxes are applied correctly to each individual item being sold, define Item Tax Types by category. This differs from Tax Groups which apply to customers. For example, clothing sold for school-age children may be exempt from a state or provincial tax but not federal tax. 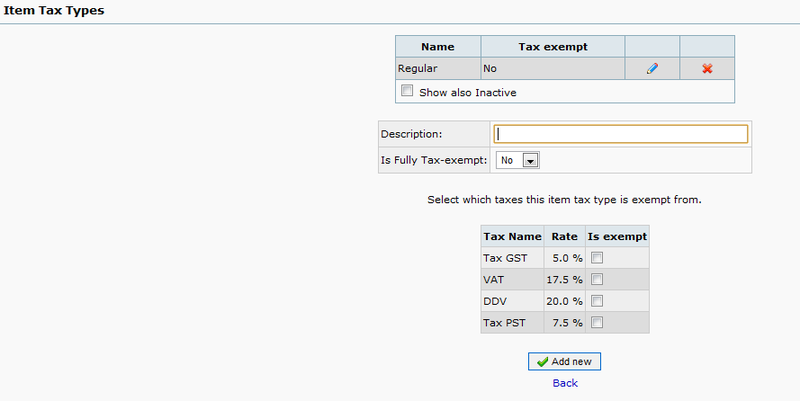 To achieve this, simply create a category and tick off the taxes which are exempt. If the category is exempt from all taxes, set the Is fully exempt? flag to yes.